Dave Luecking is a reporter for the St. Louis Review and Catholic St. Louis. Geographic areas covered: Parishes and schools in the Festus, St. Genevieve and Washington Deaneries. 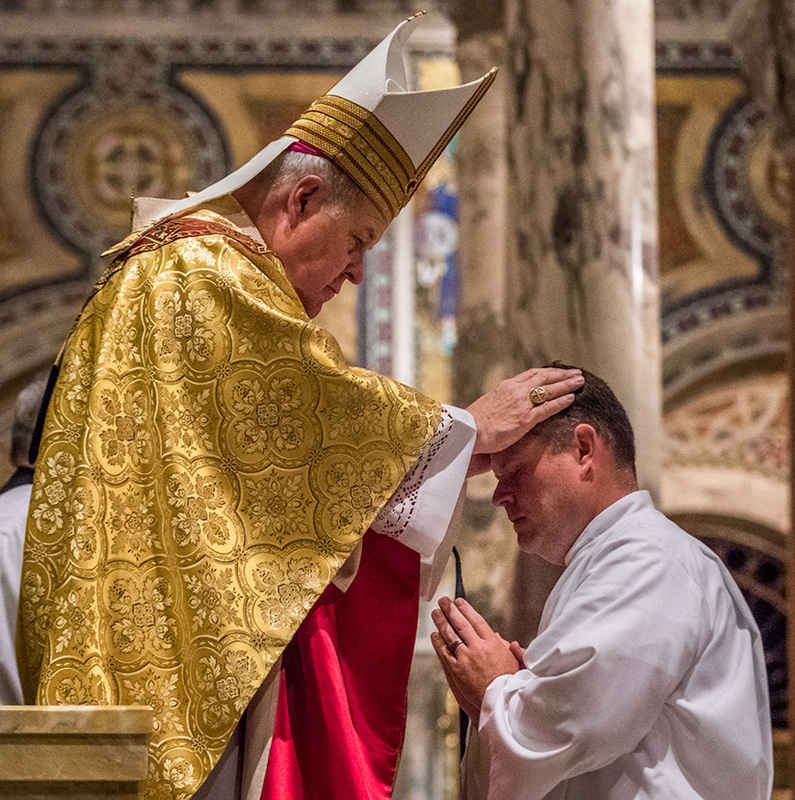 Before a packed house June 2 at the Cathedral Basilica of Saint Louis, Archbishop Robert J. Carlson ordained 25 men into the permanent diaconate, the largest ordination class in the 41-year history of the program. Archbishop Robert J. Carlson laid hands on Deacon Matthew O'Neail at the Mass of ordination to the permanent diaconate. Archbishop Carlson ordained 25 permanent deacons for the Archdiocese of St. Louis June 2 at the Cathedral Basilica of Saint Louis. The Archdiocese of St. Louis has been ordaining permanent deacons since Jan. 29, 1977, when 12 men were ordained by Cardinal John J. Carberry. Archbishop John L. May presided over a then-record ordination class of 24 in 1985, the same number as the class four years later. From 1977 through 2010, the archdiocesan had 30 ordinations to the diaconate, then shifted to an every-other-year format of ordinations. This class is the fourth to be ordained under those circumstances, and the third in a row in double figures. Archbishop Carlson ordained 21 in 2014 and 18 in 2016. The ordination classes of 2020 and 2022 each have 23 men in formation. Archbishop Carlson explained in his homily: “Remember always, … the words of 2 Corinthians 4:7: ‘We hold this treasure in earthen vessels that the surpassing power may be of God and not from us.’ At one level this involves ongoing conversion, and at another, this call to ministry and service involves the whole person. “As we read in Colossians 3:12, ‘Put on then, as God’s chosen ones, holy and beloved, heartfelt compassion, kindness, humility, gentleness, and patience,’ then next two verses (add) ‘forgiveness’ and ‘love.’ This interior change begins when one responses to Jesus call and through a deep openness to God’s grace makes the commitment to lead a fully Christian life — with a ‘day in day out’ commitment — to practice the virtues and for one called to be a deacon allowing the divine seed of charity to grow and express itself in actions which continually coincide with what God wants. 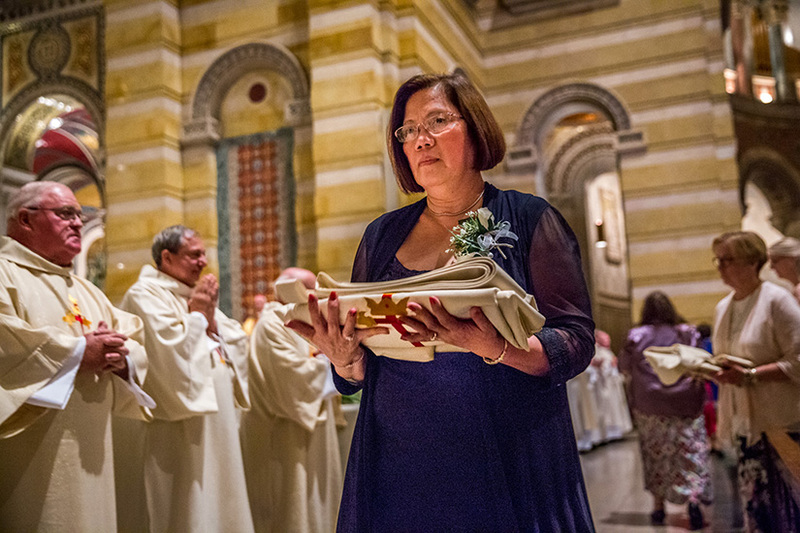 Noli Rivera, the wife of Deacon Manolo Rivera, carried her husband’s vestments. She was part of the procession of family members, primarily wives, who brought up the vestments for the new deacons. Then, laying prostrate — a human being’s must vulnerable position — the men heard in the litany of saints that the Blessed Mother, the angels and the saints have their backs.